Playing a piece of music is like telling a story. A good storyteller knows how to capture an audience’s attention, vary the pace, add in the detail that hooks the imagination, and carry listeners along, ensuring they’re eager to hear the end of the story. I had a chance to explore this crossover between words and music at Wordstock, a festival of ‘inspirational wordstorming’ run by 26, the writers’ collective. Held at the Free Word centre in London on 8 October, it attracted a host of free-spirited wordsmiths who were keen to sharpen up their writing skills in a variety of ways. Intrepid wordstormers launched themselves into activities including scrawling in fluorescent pen on festival-style tents, looking for ‘throwaway lines’ on litter in the streets and dancing like lovelorn penguins in a workshop on the language of seduction. My contribution was ‘Stringing words together’, a 45 minute creative writing workshop that encouraged people to take a creative sidestep and explore where the sounds of live harp music could take their writing. 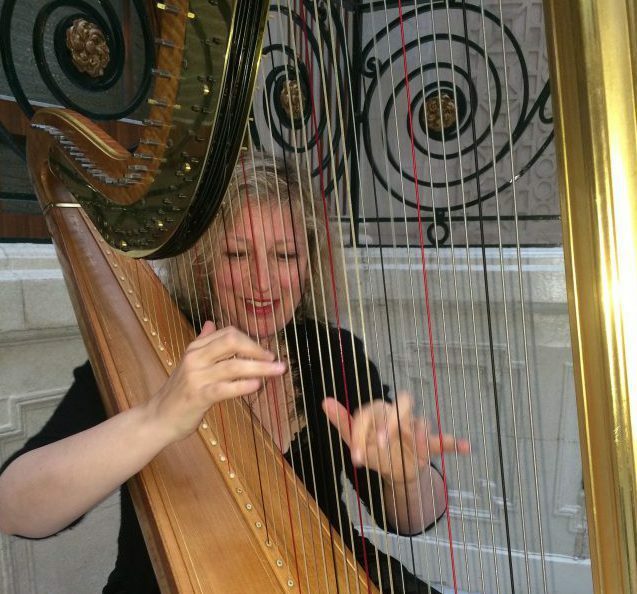 I’ve worked as a professional business writer for umpteen years, but have played the harp since I was nine. I played with a youth orchestra throughout my teenage years, which included a trip to Australia where we performed in the Sydney Opera House, and carried on studying the harp during my French degree. Since then, I’ve played the harp most days, and regularly perform with chamber musicians and amateur choral societies. So this seemed like a great opportunity to combine my passions for words and music. To be honest, I had no idea how – or whether – it would work. But Tom Lynham, the man who dreamed up the festival, was prepared to let me have a go. At 11am on that Saturday morning, a group of around 15 writers gathered in the central hall, forming a semi-circle around the harp. Although we were indoors, there were full-size trees in giant pots behind us and crisp autumn leaves scattered on the ground, so the hall was transformed into a slightly surreal woodland scene. I played barefoot, and enjoyed the sensation of the leaves brushing against my feet on the wooden floor. Most participants were either musicians themselves or music-lovers, and all approached the workshop with admirably open minds. I encouraged everyone to relax, enjoy the music and see where it took them. The idea was for me to play five pieces each lasting around five minutes, and for people to write in a freeform stream-of-consciousness while I played. This technique is sometimes called ‘automatic writing’. I was also inspired by Natalie Goldberg, a best-selling American author who has created a form of writing practice that draws on Zen meditation techniques. Essentially, the rules are: “Keep your hand moving, don’t censor yourself and don’t edit as you go”. We all know how good it feels when you’re really in the moment and going with the flow. You feel at one with whatever it is you’re doing and every action naturally leads to the next. It’s a gift if this happens when you’re writing. You start with momentum and passion, spurred on by the initial thought or phrase that comes to mind, and you just ride that wave – words spilling effortlessly out onto the paper, one after the other. For me, it happens when I’m running, when I forget about the hill or the pothole or the shoelace done up a little too tight, and just get into my stride and seem to fly. It also happens when I’m playing the harp, usually after I’ve been playing for around an hour. I feel at one with my instrument and the music, and even notice a difference in the quality of my breathing. I breathe more deeply, am more relaxed and for some reason imagine I can smell the spruce of the soundboard as it reverberates with the final notes. Rhythm is fundamental for writing. Juxtaposing short sentences with long ones. Alternating flow and staccato. Reading your words out loud to decide where you need to add or subtract a syllable. One piece that uses rhythm in subtle and seductive ways is the ‘Oriental Dance’ by Enrique Granados (link to Granados playing the piano version). It’s a dance in three/four time, yet almost has the feeling of having one beat in the bar, rather than three. In the middle section, the left hand picks out the off-beat, emphasising the Spanish origins of the piece and somehow managing to make the harp sound more like a guitar. Benjamin Britten wrote A Ceremony of Carols as he returned from American to Britain on a five week sea voyage in 1942. The whole work is infused with the struggle between war and peace, dark and light, good and evil. Apparently he drew on the Mediaeval musical theory that triplets are perfect, as they represent the Holy Trinity, whereas time measured in beats of two is imperfect, as it represents man, with his two arms, two legs, two eyes and ears. In this work, double and triple time are frequently set against each other, battling it out. The Interlude at the centre of the work is a harp solo – a translucently beautiful piece. Delicate harmonics frame the beginning and end of this movement, while the louder, more discordant notes of the central section provide contrast and drama – two elements that reliably add spice to written work. Still exploring the rhythmical landscape, we moved onto the power of threes in writing. Speechwriters love threes as a rhetorical device, from Julius Caesar saying “I came, I saw, I conquered” to Tony Blair promising “education, education, education”. Three is a very satisfying format for both writing and music. In writing, it delivers a beginning, a middle and an end. In music, it often delivers a theme, a diversion, and a return to the original theme. The final piece was ‘Chanson dans la Nuit’ by Carlos Salzedo. Written in 1927, this work uses a variety of techniques that were unusual at the time, including playing with the nails rather than with the tips of the fingers and tapping with the fingers on the soundboard. In both music and writing, if we hope to move forward, we must constantly embrace new approaches and new techniques. If I held the workshop again, I’d want to allow more time so people could listen to each other’s writing and share experiences and impressions as they went along. But personally, I really enjoyed this experiment. It was great to hear the writing that the music inspired, and to witness how people felt liberated by the music to write in a new – and perhaps unexpected – way. I’d love to hear what you think. What are your experiences of the crossover between words and music? What types of exercise would you like to try in a workshop like this? And have I missed any crucial elements? Please get in touch and let me know. Fiona is a freelance writer and a board member of 26. Recent work includes writing brand stories for a Somerset cider producer, an investors’ brochure for a company in Hull that has produced a 100% compostable and biodegradable plastic, web content for a fostering agency and a series of case studies for Deloitte. She also runs workshops in marketing communications. This piece originally appeared on the 66,000mph website.